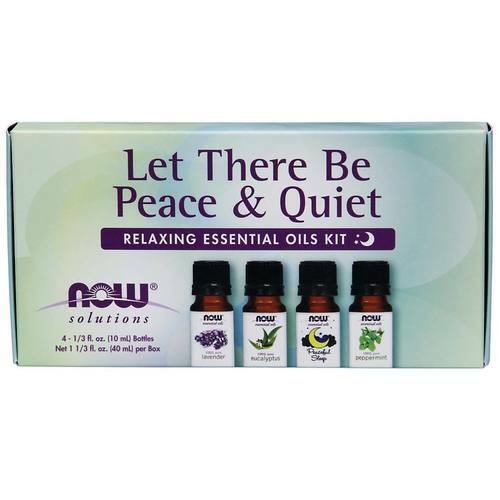 Now Foods Let There Be Peace and Quiet is a blend of relaxing essential oils for proper aromatherapy. Warnings: Avoid contact with eyes. If pregnant or lactating, consult your healthcare practitioner before using. Not for internal use. Peaceful Sleep Blend: Do not use on skin. Reacts strongly to sunlight and other sources of ultraviolet light. Notes: Includes one 1/3 fl oz (10 mL) bottle of each: Lavender, Eucalyptus, Peaceful Sleep and Peppermint. Ingredients: 100% Pure Lavender (Lavandula officinalis [spp. ]), 100% Pure Eucalyptus Oil (Eucalyptus globulus), 100% Pure Peppermint Oil (Mentha piperita), Orange oil, tangerine oil, lavender oil, chamomile oil, ylang ylang oil, sandalwood blend. Check individual products for individual ingredients. Recommended Use: Add to a diffuser, add 4-5 drops to a hot bath before bed or create a room mister by adding 30 drops to 1 oz. of water in a spray bottle. Great for unwinding before a nap or for a good night's sleep. Use caution when adding essential oils to a bath tub since they can make surfaces slippery. For all other uses, carefully dilute with a carrier oil such as jojoba, grapeseed, olive, or almond oil prior to use. Please consult an essential oil book or other professional reference source for suggested dilution rations. Peaceful Sleep blend cannot be used outside of aromatherapy. The customer reviews posted below are based on individual consumer experiences and may NOT necessarily represent what expected results will be from using or taking Now Foods Essential Oils Kit Let There Be Peace and Quiet - Relaxing - 1 kit. These results may not be typical and you should not necessarily expect to receive the same results. Actual results may vary. Essential oils is a new world for me. Essential oils is a new world for me. I have tried the Now Foods Let There Be Peace and Quiet Essential Oils Kit and Ultrasonic Dual Mist Oil Diffuser. My entire family is enjoying the new scents in our home. If I don't turn it on, my daughter or hubby will come a long and start it up with their favorite scent. The Peaceful Sleep oil and Lavender each help us to enjoy a calming environment right before bedtime. I leave it going for about three hours next to my son's bed.